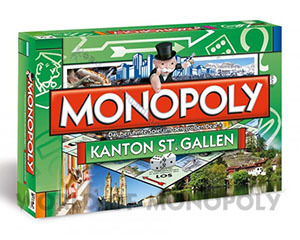 This is the first version of Monopoly based on eastern Swiss cantons, with others to follow. 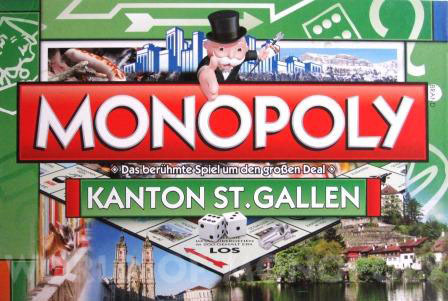 The Canton of St. Gallen gets its own Monopoly. 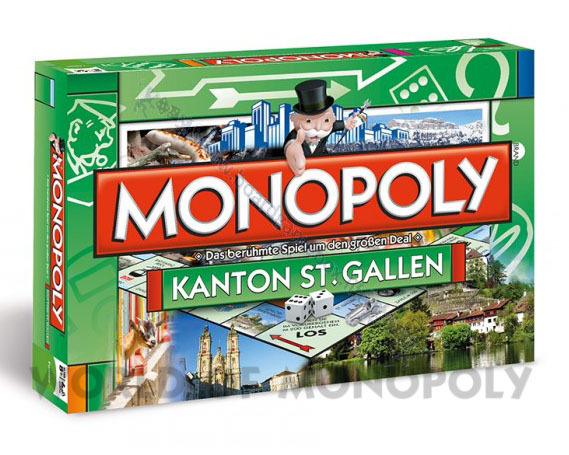 The Marktgasse in St. Gallen and the Hof zu Wil are the most expensive places in this edition as well as other known places, streets and buildings from Gossau to Sargans. "We wanted to design a game that comes along well balanced for all St. Gallen." The event cards and the community areas have been adjusted: So you can stuck in traffic, for example on the Rapperswil Seedamm remain or linger too long at the Olma. Also for OpenAir St. Gallen there is an event card. Year: 2015 - Code: ?? ?